Preferred by sommeliers, wine stewards, waiters, waitresses, and bartenders.Forget those fancy corkscrews that take forever to get a cork out. Our DOUBLE HINGED WINE OPENER lets you work quickly and effectively. Easy to use, easy to carry, easy to clean.Coated, non-stick worm glides easily and smoothly into the cork. The double hinged fulcrum lets you extract short or long corks with ease and without crumbling. A serrated foil cutter and bottle opener means you don’t have to reach for another utensil. Handy size is lightweight and fits easily into a vest, pant, or apron pocket. Always have it at your fingertips when you need it. DURABLE & VERSATILE: Constructed of tough materials, the B&M Tools Wine Opener will stand the test of time. 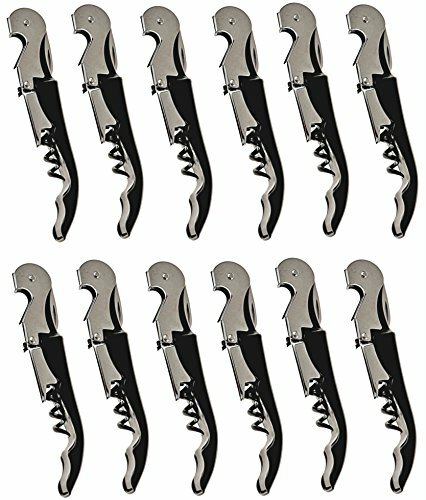 Features a coated, non-stick worm to provide a smooth glide into the cork, serrated foil cutter, and convenient bottle opener. The ergonomic handle provides grip and comfort. EFFICIENT, EASY TO USE: The multi-functionality and ease of operation of our WIne Opener lets you work quickly and efficiently without having to look for various tools and gadgets. Convenient size, easy to carry in a vest or pant pocket, it will always be close to hand. MULTI-PACK: Our multi-pack saves you money. Always have a wine opener nearby and ready when needed. Great for restaurants, bars, and catering. CUSTOMER SATISFACTION: As with all B&M Tool products, our wine opener is backed by a 1 YEAR WARRANTY and a 30 DAY MONEY BACK GUARANTY.